You are currently browsing the tag archive for the ‘Smoking News’ tag. Maybe Chantix isn’t so good? WASHINGTON — Daniel Williams decided he’d listen to his girlfriend and his 8-year-old son and finally quit smoking, with the help of a new prescription drug called Chantix. He started taking the medication, and a couple of nights later, as he was driving his pickup truck on a country road in Louisiana, Williams suddenly swerved left. His girlfriend, Melinda Lofton, who was with him, later told him that his eyes had rolled back in his head and that it had seemed as if he was frozen at the wheel, accelerating. Moments later, they were in a bayou, struggling to escape the murky water, Williams said. “Since I was a kid, never had anything like this ever happened before,” he said. The nonprofit Institute for Safe Medication Practices last week linked Chantix to more than two dozen highway accidents reported to the Food and Drug Administration, saying the mishaps may have resulted from such drug side effects as seizures. The FDA had earlier issued a warning about suicidal thoughts and suicides among patients taking Chantix and is now evaluating whether it needs to expand and strengthen that precaution. Pfizer, the drug’s manufacturer, said that as early as May of last year, it had added a warning to the prescribing literature for Chantix that patients should exercise caution when driving or operating machinery until they know how the medication affects them. But such admonitions apparently didn’t get much notice from busy doctors. Even some government transportation agencies missed them. The Federal Aviation Administration continued, until last week, to list the drug as approved for pilots. The federal truck safety agency was also unaware of the risk. “That is a problem,” said Janet Woodcock, head of the FDA’s drug evaluation center, adding that her office needs to find ways to communicate safety information more effectively. The military, which bans Chantix for flight and missile crews, is considering whether other precautions are needed, Pentagon officials said. Woodcock said the FDA believes the medication should remain on the market as an option for smokers trying to quit. Approved two years ago, it differs from other smoking-cessation drugs by acting directly at sites in the brain affected by nicotine, blocking the pleasure that comes from smoking as well as the cravings. But Williams, 28, said he was surprised that a drug he had hoped would help turn him into a healthier person instead, he believes, caused an accident in which he could have been seriously hurt, even killed. Lofton is still struggling with a neck injury she suffered. Williams, a telephone service technician, lives near Rayville, La., between Shreveport and the Mississippi River. 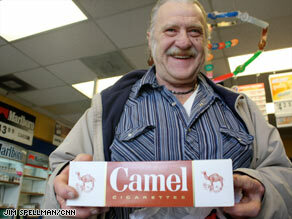 He said he went to see his doctor last year for help quitting his nearly two-pack-a-day habit. He’d started smoking in high school and had failed in previous attempts to quit. But he knew people who recommended Chantix. They were talking about how good it was supposed to be, and it seemed like the right thing to do since I was trying to quit,” Williams said. The crash occurred July 15, two days after he started taking Chantix. He said the last thing he remembers is heading home after checking on the house of a friend who was out of town. Lofton had gotten out first and was on the bank, calling to him. He followed the sound of her voice and paddled to safety. Williams said he had no history of seizures and does not drink alcohol. His doctor, who has treated Williams from childhood, made the connection to Chantix. Williams said he was considering suing Pfizer. His lawyer, Kristian Rasmussen of Birmingham, Ala., said he was aware of at least one other Chantix accident, involving a deliveryman who fell out of a moving truck. The FDA has received more than 3,000 reports of serious problems involving Chantix, but Pfizer said that had to be put into context, since more than 5 million people in the U.S. had taken the medication. The company said that no direct cause and effect had been proved between the drug and the problems. The FDA is most concerned about reports of mental health problems, including more than 400 cases involving Chantix users who reported suicidal thoughts and more than 30 who killed themselves. Yet many patients report success with the medication. Kathy MacInnis, 44, of Kingston, Mass., said she had been smoking for more than 30 years and quit on New Year’s Day. She was smoking close to two packs a day when her 12-year-old daughter confronted her. MacInnis videotaped her story for Pfizer but she said the company did not pay her other than covering the costs of traveling to New York for an interview session. Banning Smoking in Bars and Restaurants Increases Business! This just in. If you think by allowing people to smoke is good for your business, you’re sorely mistaken! Studies of restaurants and bars in Boston, New York City, San Francisco and Washington D.C. all show business up since they banned smoking. Chicago went smoke free the beginning of this year. In the United States, 23 states have already banned smoking in restaurants and bars. A number of other states, including Michigan, are considering it. While many bar and restaurant owners say a smoking ban would hurt business, that appears to not be the case at all. So you think there’s nothing wrong with a little second hand smoke? According to a case report by a Michigan State University physician, published in the February edition of the American Journal of Industrial Medicine, a woman arrived at a bar in Michigan for her shift as a waitress and, according to co-workers, seemed happy and healthy. About 15 or 20 minutes later she collapsed and within a few minutes died. In 2006, the surgeon general’s report concluded that ETS causes coronary heart disease, lung cancer and premature death. But at that time there was little hard evidence linking ETS to the exacerbation of asthma in adults. ETS for the uninitiated is shorthand for environmental tobacco smoke or “second hand smoke”.